A number of major automotive companies have started commercialisation of hydrogen fuel cell vehicles and most currently use high-pressure (350 or 700 bar) composite tanks for H2 storage. In the long run, there is a need for on-board hydrogen storage systems that allow a more ‘conformable’ tank design operating at lower pressures while maintaining storage capacity. To address this, hydrogen storage media can be introduced into the tank, typically as compressed powder pellets or liners, to improve hydrogen storage capacities. These materials can store hydrogen either via physisorption or via dissociation in chemical (complex) or metal hydrides. Low mass and volume systems are also required for static applications such as storing intermittent renewable electricity, e.g. to reduce plant footprint and capital/operating costs. 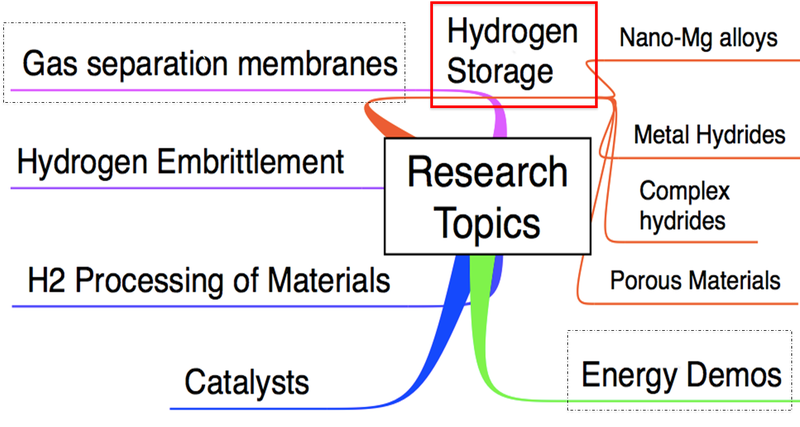 One part of this work package (led by Prof. Tim Mays) looks at advanced nanoporous materials such as carbide-derived carbons, metal-organic frameworks (MOFs), polymers of intrinsic microporosity (PIMs) and inorganic (including carbon) nanotubes integrated into high-pressure tanks (see Figure 2.3) to improve storage capacity or to reduce pressure with possible additional benefits in integrated tank design such as strength and conformability. Advanced materials introduced into H2 storage tanks to increase capacity or reduce pressure. Another part of this work package (led by Prof. David Book) looks at solid state storage of hydrogen, considered as a safer and hence more viable option for future applications, with specific focus on complex hydrides (e.g. borohydrides), magnesium alloys and nano-carbons. The project aims to determine how nanoporous adsorbents may be incorporated into Type IV high-pressure gas tanks (operating at ~70 MPa and ~298 K) to enhance hydrogen capacity in transport applications, optimise storage conditions and confer additional benefits in terms of thermal and mechanical properties. If the project ideas work, tank safety may be improved – contributing to better personal and property protection for hydrogen-fuelled vehicles. This project will investigate the structural (pore) characteristics of carbon-based hydrogen storage materials that enable solid-like, supercritical hydrogen storage. The aim is to understand how new materials can be constructed that will provide the same level of densification alonside higher pore volumes for increased storage capacity.